Kayak World Products is pleased to present the brilliant Green BIC Trinidad Fishing Kayak. 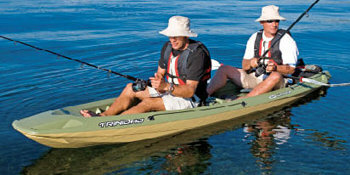 The BIC Trinidad Fishing Kayak in green provides room for 2 adults and 1 small child. The stable and sturdy platform makes fishing easy. With several storage compartments and deck straps, this kayak ensures your gear stays safe and dry. The tri hull design optimizes speed while maintaining stability. This kayak utilizes Twin Sheet Technology for a lighter, more durable, easier-to-paddle kayak. Integrated footrests, EVA foam seat cushioning, cup holder, inserts for backrests, and pole holder ensure comfort for long days on the water. Protection grab lines, front and back abrasion guards, reserve buoyancy, mooring straps, and 4 self-draining scuppers make sure you have a safe journey on the water. For this reduced price, the BIC Green Trinidad Fishing Kayak is widely recommended and a popular choice amongst lots of people. Fishing from a kayak is a sport that has developed rapidly in the last few years. A kayak allows you to get off the beach easily without needing a big, heavy boat. In a kayak you can go fishing where and when you want, solo or with friends. Camouflaged colouring of green and beige helps the kayak disappear into its background. The rear storage deck with integral elastic straps allows you to carry bags or cases with extra equipment. Stable and fast, the Fishing series get you quickly to the best fishing spots, and into very shallow or rocky water without risk. You’ll be right out there in nature ! Compact but wide, the Trinidad is the kayak for double paddling. It's a highly stable boat, designed for solo or two-person fishing trips. Like the Kalao, it's got great storage possibilities for your fishing equipment. It can be fitted with the appropriate mountings to take a small electric motor. The Trinidad is a super compact two-seater kayak capable of taking two adults and one child on board. Compact but wide, the Trinidad is an excellent kayak for double paddling. It's a highly stable boat, designed for solo or two-person fishing trips. With great storage possibilities for your fishing equipment, it can also be fitted with the appropriate mountings to take a small electric motor. Fishing from a kayak is a sport that has developed rapidly in the last few years. A kayak allows you to get off the beach easily without needing a big, heavy boat. In a kayak, you can go fishing where and when you want, solo or with friends. The camouflaged coloring of this green and beige fishing kayak helps the kayak disappear into its background. The rear storage deck features integral elastic straps that allow you to carry bags or cases with extra equipment. Stable and fast, the Trinidad gets you quickly to the best fishing spots and into very shallow or rocky water without risk. The Trinidad can carry two fishermen with gear and is compact but wide. For more info, please go to http://www.ukrekt.nl Fotoregistratie met foto die ik genomen heb direct na de aanschaf van deze Bic Bilbao Fishing Editon. Fishing Trinidad with Mary where she caught her first fish in the ocean and was on a Kayak.